Sunday was an early day - especially after losing an hour overnight. We were at the R/Seahawks Park at sun-up so Bill could get some flying in. Bill flies electric RC planes (he has several). They are quiet so he can fly at dawn. The gas engine planes are noisy so they cannot take off until 9 a.m. Bill likes to fly between dawn and 9 o'clock - but then he stays around to socialize with the other fliers. Several wives were there to watch their husbands fly so I had a great time visiting too. I have never seen a woman at the controls - but I'm sure there are some. 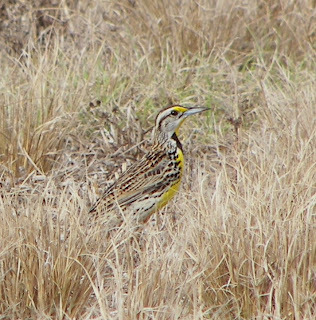 The Eastern Meadowlarks are abundant in the fields at and around the flying park. This beautiful Florida Scrub Jay was sitting atop a large bush. 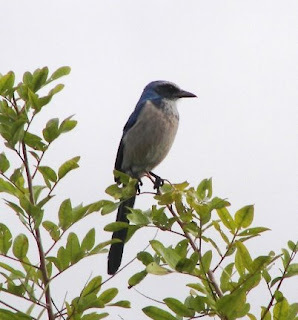 These Jays - the only one without a crest - are found only in Central Florida. Cape Coral is the southernmost part of their very limited range. We also saw lots of Common Ground Doves, the smallest of the Florida dove family at only 6 inches; a Loggerhead Shrike; and the ever-present Vultures circling overhead. 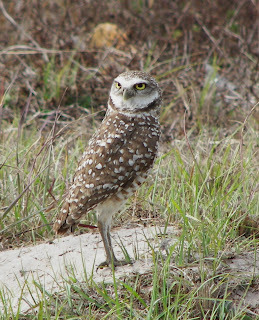 After leaving the field, I had to stop and check in on the Burrowing Owl nests. When we arrived at this nest, we saw sand flying out as one of the pair of owls was burrowing deeper into the ground. The mate was keeping a close eye out for intruders. On the way through Cape Coral, we stopped at a restaurant that had been recommended to us for a delicious seafood lunch - scallops - YUM! With full bellies, we decided we needed to walk. We found a park near the Midpoint Bridge that goes over the Caloosahat-chee River to Fort Myers. It had a nice boardwalk through mangrove trees and opening out to the river - where Bill took this picture. 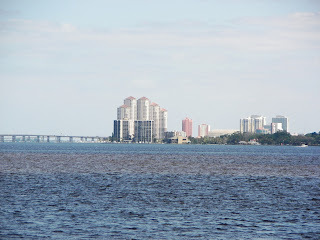 The bridge to the left is the bridge from downtown to North Fort Myers and Cape Coral. We call it the free bridge as the other two bridges have a $2 one-way toll. The rest of the day was spent at the pool socializing with neighbors. Since the wind was calm, Bill went flying again on Monday morning and is there now as well. This gives me time to get some work done. Yesterday I saw a Swallow-tailed Kite flying overhead. They are easy to identify with their black and white underparts and long forked tail. People around here say that when the Kites return (from Central and South America) the weather will stay warm - and so far that has been true. Soon you will be a card carrying member of the Audobon Society. Awesome pictures!! !